Automating your activity is often referred to as ‘botting’, the colloquial term for using a robot to perform activity on your behalf. As well as fully featured betting and trading tools, Bet Angel also includes many “bot” type features. 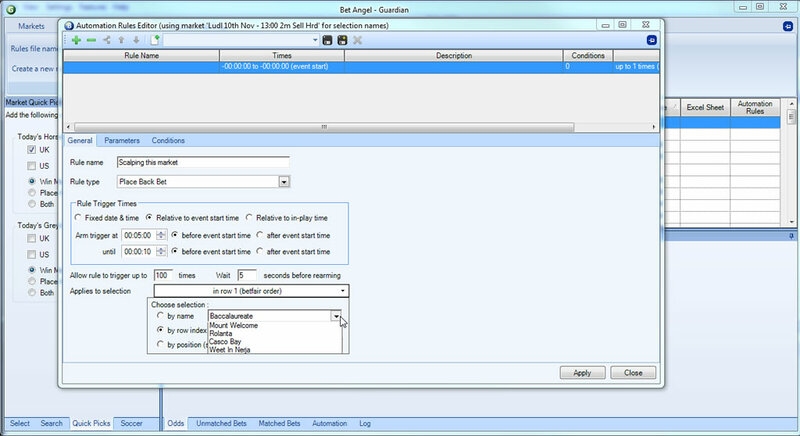 Using Automation with Bet Angel will save you time and improve your effectiveness in a market. You can standardise a strategy, test a theory, supplement your existing activity, participate at low risk on new markets, automate the entry or exit of your positions in a market and much, much more. You can even run different automated strategies on multiple markets all at the same time. The sky is the limit! Switch on Bet Angel in the morning, start up your automation and return at the end of the day to see how you did. 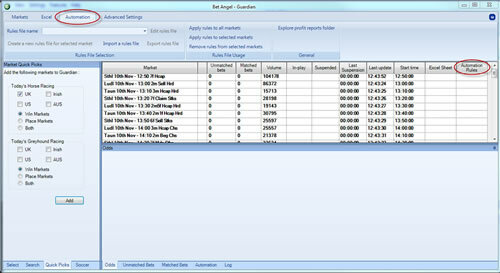 Better still, using Bet Angel’s practice mode will enable you to test all your ideas, concepts and strategies without risking any of your money. 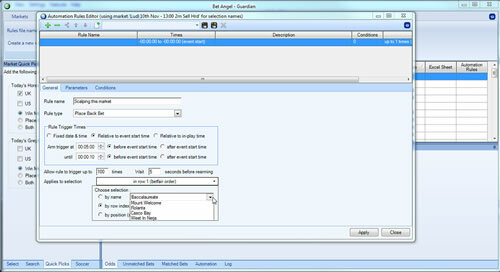 The new advanced automation with Bet Angel will allow complex automated betting. For example you could use this to back the favourite, or third favourite at 45 seconds before the off time. Or perhaps lay the draw in a soccer game before the off and automatically green up at half time. All this can happen fully automatically and quietly in the background, with different types of automation rules, on multiple markets, whatever you are doing on the main interface. This allows you to concentrate on other things while Bet Angel works away for you elsewhere or fully automatically through the day or overnight. For example, you may want to back every favourite throughout the day as long as the price is below x. Or you may wish to LAY the 3rd favourite as long as the price is above y. Or you may wish to back all with a two tick offset 30 seconds before the off and then green up at 10 seconds. The advanced automation feature within Guardian will allow you to do all this. Try for free today. Existing users can upgrade for free! Download from the download section of our website.